International teens share Toledo experiences at library. In a variety of languages but with the same enthusiasm, exchange students from around the world shared their experiences of living in northwest Ohio with an audience at the West Toledo Branch Library on Saturday. The event was hosted by local literacy nonprofit Books4Buddies and the American Cultural Exchange Service, which places international students in high schools across the United States for an academic year. 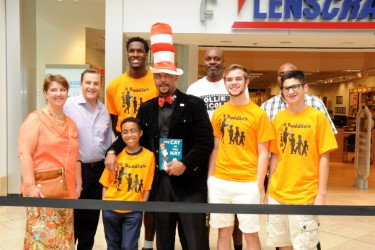 Books4Buddies' Tyson Robinson makes an appearance on WTOL. Books 4 Buddies ambassador Tyson Robinson, a junior at Toledo Technology Academy, talks about the program and the upcoming Youth Global Perspectives event. A Touching Testimonial from Ben Cathey. Books4Buddies has made gigantic strides in just a few short years. I'm looking forward to seeing real impacts and progress in the literacy of Toledoans in the coming decade, as the recipients of free books come of age. B4B doesn't just help kids in need of their first books. They also provide hope for the MENtors, add tangible meaning for donors, and show the ambassadors a new side of their city. The MENtors and board members get a great experience of helping both ambassadors and local children. Whether it's a summer cookout at the Birmingham Terrace, or watching future leaders bond with foreign exchange students, it's a low-cost, high-reward experience for the 'adults' of Book4Buddies. Donors can't always see a true impact on their dollars. But giving to Books4Buddies is different; you see the pipeline of where your money goes, and even small donations multiply their effectiveness time and time again. The biggest change is often in the ambassadors. Those high schoolers willing to give their time and hearts learn about impoverished parts of Toledo they may have only seen in the news. They don't just get a line on their resume' or college application. 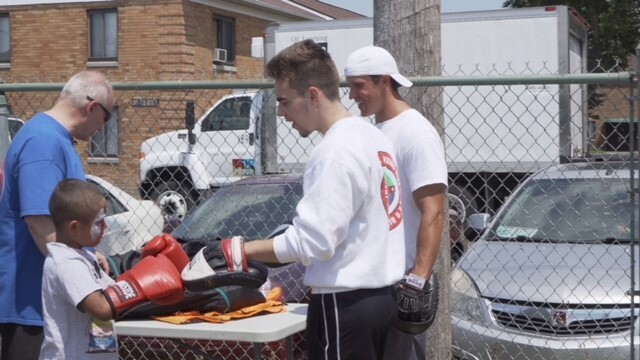 These teens get real-world media experience, business connections for life, and an appreciation of what they have. Tracee Ellis of the American Cultural Exchange Service (ACES) posted this amazing video. Take a look! Thanks, Tracee. “Little things make big impacts in any children’s life. A book may seem to have little value for most of the people but as a young African boy, I know the value of a simple book. Books4buddies was one of the GREATEST CHANCES I had to work towards promoting literacy around my host community and now to the world, back home. I shared how education was a fundamental part on making me the man I am today and how people have to remember that the base of a good life, is an excellent education. I also found in Books4buddies amazing young men who helped me integrate and understand more easily the differences between my culture and the American culture. The most admirable qualities of American youth are never giving up on their dreams and hard work to get what they deserve. No matter how hard it looks like, how far they still have to go, they don’t give up, but find new and creative ways to achieve their dreams! 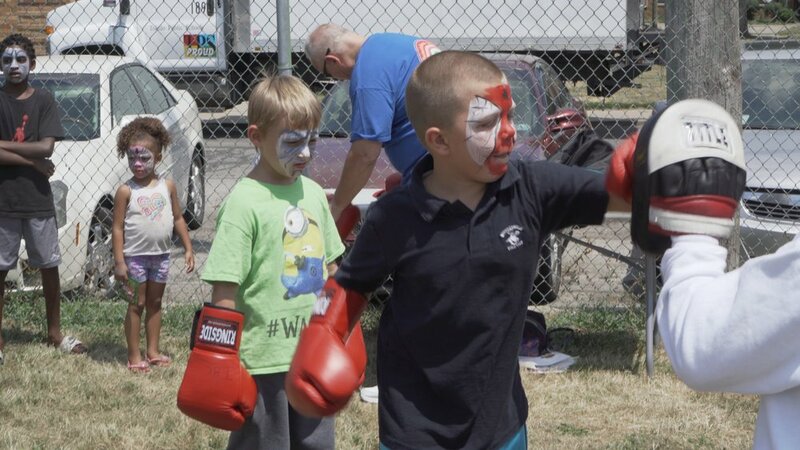 As part of PBS’ Great American Read, this episode of “The Journal” focuses on locals who are advancing the value of reading in Northwest Ohio. Discussion includes the Books 4 Buddies program and community reading initiatives involving Bowling Green State University and the Wood County District Libraries. Also, a father and daughter talk about how reading has shaped their relationship and lives. Books 4 Buddies interview starts at 18:06. 2018 Books and Hooks was a success. We had another successful Books and Hooks event this year at Weiler Homes. Here are a few images from the event. Thanks to all our volunteers and to all that came out to participate. A message from Birama, one of our ambassadors in Senegal. All of us here at Books4Buddies would like to thank our sponsors and the Toledo community for helping us spread our mission. Thank you! Without your support, none of this would be possible. Perry Field House at Bowling Green State University Saturday hosted scores of future Don Tates. Tate, a prolific illustrator of children’s books who has turned his talents to writing as well, was the guest author for Literacy in the Park. The Austin, Texas-based author and illustrator started out just like all the kids who raised their hands when he asked: Who likes to draw? He’s been drawing since before he could remember, and showed a picture he made when he was 3 of his mother, and baby sister, and some poop falling out of the infant’s diaper. Even then, he liked to include realistic details. When he was a kid growing up in Des Moines, Iowa, Tate said he particularly liked non-fiction, including the “Family Medical Guide,” which had pictures of bloody ulcers and pus-filled toe sores. And when he turned to writing his own books, as well as illustrating them, he turned to non-fiction, writing about strongman Eugen Sandow and early African-American poet George Moses Horton. Those themes were among those reflected in the dozens of activities available to children throughout the field house. Nothing, though, about pus or bloody sores. Still the activities showed how literacy is intertwined with construction, natural science, art, drama, and nutrition. Tate encouraged his young listeners to follow what they loved whether it was dancing, theater, or soccer. Tate said as a child he wasn’t as good at basketball as his father would have liked. He instead wanted to make puppets. He realized he could make a simple puppet with patterns and cloth. He wasn’t satisfied. Using an old wig his mother gave him, he made a more elaborate puppet modeled on the Muppets made by his idol Jim Henson. His mother loved it, but Tate’s father wasn’t impressed. “Your son is making dolls,” he told Tate’s mother. Young Tate persisted drawing, painting, doing macramé. His work progressed along the way and led to a career in illustration. He’s illustrated more than 50 books, including work by such notable writers as Jack Prelutsky and Louis Sachar. When he decided to write a book, he did about 30 drafts of “It Jes’ Happened: When Bill Traylor Started to Draw.” It’s a true story of a man, born into slavery, who became a renowned folk artist. Then he showed it to a published author, who loved it, and told him it needed to be rewritten. That happened twice more. But every time he rewrote it, the book got better, Tate said. A published book doesn’t just happen. When it was published, it was a success and won awards. His book on the strongman Sandow, considered the father of modern body building, was also based on fact as well as the author’s personal experience. As an adult, Tate decided to take up body building, and despite early disappointment, he went on to win trophies. Tim Murnen, BGSU faculty member coordinating the event, said bringing in Tate was a bit of a risk. He doesn’t have the name recognition of past guest authors. But he took a different path to a career in children’s literature. He went to a trade school for high school and then community college. It was a story he shared Friday with students at Penta Career Center. Murnen does literacy research and outreach. Literacy in the park is a keynote event for those outreach efforts, but it is not sufficient. 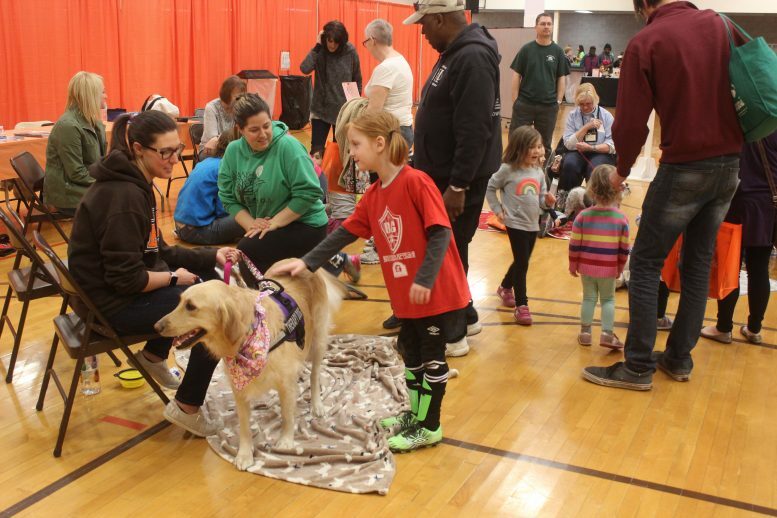 The event is meant to send ripples throughout Northwest Ohio and promote programs throughout the year. One such program is Books4Buddies (Books4buddies.com). They do that by recruiting young high school age men to help collect and distribute “gently used” books. The effort has distributed more than 50,000 books. 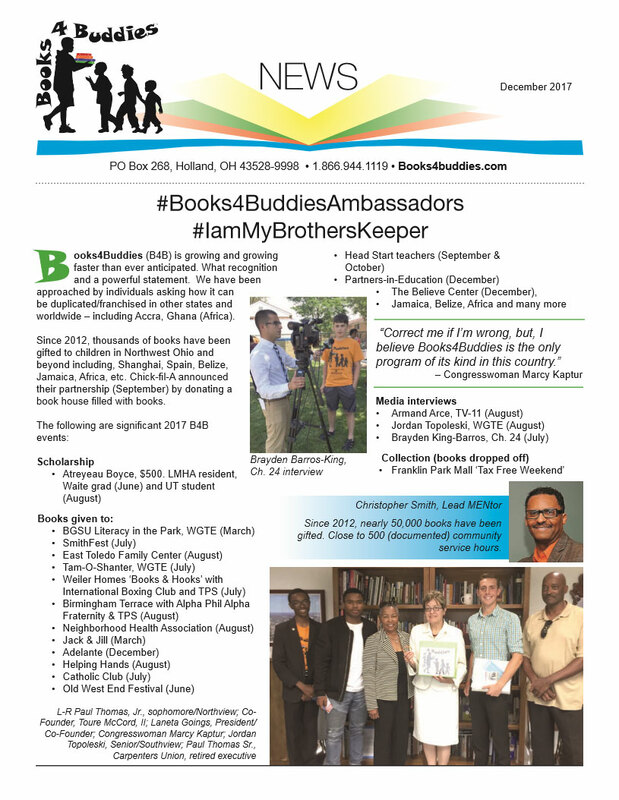 The Books for Buddies ambassadors have come from local neighborhoods, but also from Ghana, Senegal, and Pakistan, and those ambassadors want to bring that effort to their countries. Literacy in the Park is a good event for the effort. They understand they “are blessed” to be able to share with others what they have benefited from. For all the good intentions and serious purpose behind the day, it is about having fun, whether with Play-Doh or finding the hidden sugar in foods. Joe Rosansky was there with his daughter Teagan, who is, she indicated, four-fingers old. Teagan reports she likes, after a long pause, “the flowers.” Those flowers were lining the front of the stage. And when Tate opened the floor up to questions after his presentation, the first question was: “Where’d you get the flowers? Bostdorff’s, Murnen said from off-stage. That’s just the kind of detail a young Don Tate would have liked. The kind of attention to detail that can blossom in so many ways. Tom Cole's (BCSN) interview of Armand Arce (St. John Jesuit) and Gil Rutazihana, Mozambique (Start honors student) as they discussed Youth Global Perspectives. Download the December 2017 Newsletter here. 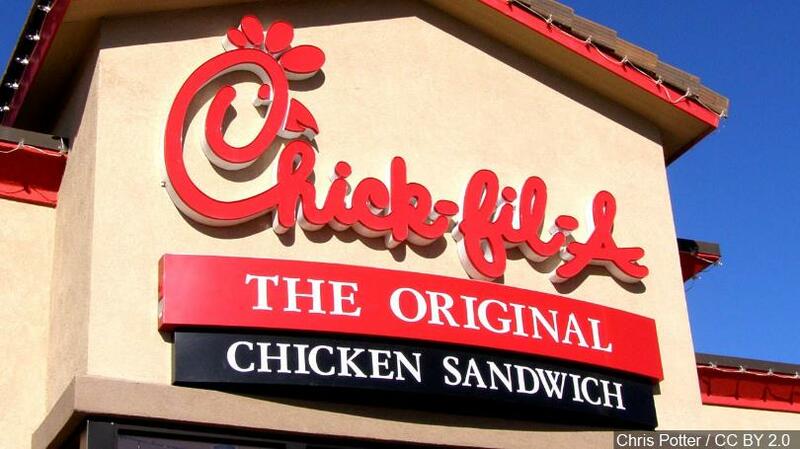 SYLVANIA TOWNSHIP, Ohio (WTVG) - Chick-fil-A is set to launch its newest location in Sylvania just after Labor Day. The new restaurant is scheduled to open its doors on Wednesday, Sept. 6, 2017. The grand opening celebration includes the chance for 100 adults to camp out, earning themselves a one-year supply of chicken for free. 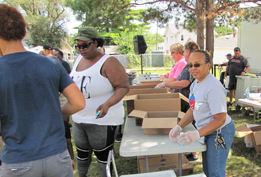 Participants will also help package 10,000 meals to benefit the Toledo Seagate Food Bank. People can also donate new and gently used children's book that will be given to Books 4 Buddies, which provides books to children in our community. The grand opening celebration starts 24 hours before the store opens its doors. On Tuesday, Sept. 6, the family-friendly overnight camp out begins. The first 100 adults through the door get one year's worth of free Chick-fil-A meals. For rules about eligibility, click the "Opening Celebration" link on this page. Franchise Owner Justin Amburgey currently operates the Airport Highway location in Holland. The new store is located northeast corner of Central Ave. and McCord Rd. It will create 100 new, full and part time jobs. For more information on how to apply, click the "Hiring Information" link on this page. Chick-fil-A has been named one of the "best places to work" by Glassdoor. The company also offers the opportunity to earn college scholarships..
Chick-fil-A team members are also eligible for the chain's initiative, Remarkable Futures, which provides $4.9 million in annual scholarships. Having awarded nearly $38 million since 1973, scholarships are available in three categories, ranging from $2,500 to $25,000, based on leadership, community involvement and academic achievement. Over the years, the restaurant company, which employs more than 75,000 individuals through both corporate positions and franchised locations, has provided almost $38 million to help its team members pay for college. "We're honored to be recognized as a top workplace and know that team members will find the same opportunities for growth and leadership at our new location at Central and McCord," said Amburgey. "We encourage community members who are passionate about serving the freshest food in a friendly environment to interview to join our team." L-R Paul Thomas, Jr., Jr/Southview who just returned after being selected in a weeklong entrepreneurship training program for high school students; Co-founder Toure McCord; Laneta Goings; Congresswoman Kaptur; Jordan Topoleski, Sr, Sylvania Southview. He was one of 1250 at Boys Nation selected as one of two senators to represent Ohio. He was in DC for nine days and met elected officials; Paul Thomas, Sr. retired executive of the Carpenters Union. 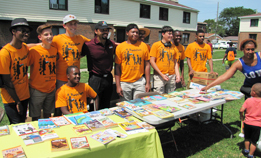 On Saturday, August 12, Books4Buddies held a back-to-school event at Lucas Metropolitan Housing Authority’s Birmingham Terrace in order to bring free books and snacks to the residents. 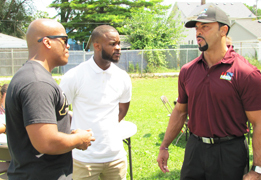 The “Book Ambassadors” – the students who coordinate the book program – were joined by members of Alpha Phi Alpha Fraternity, Inc and State Rep. Mike Sheehy. Books 4 Buddies is an organization that collects new and gently used books for disadvantaged children and young adults. Over the years, Books 4 Buddies have distributed more than 40,000 books all around northwest Ohio and the world. On Monday August 14, founder Laneta Goings and the ambassadors met with Congresswoman Marcy Kaptur, a Books4Buddies supporter. “ I don't think there's another program of this kind in the country, correct me if I'm wrong,” noted Kaptur. 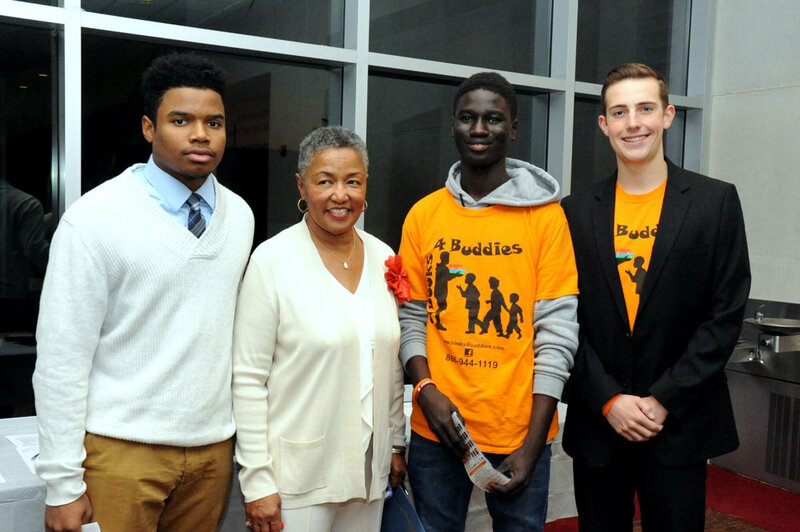 Books4Buddies Ambassador attends NSLC Yale Business & Entrepreneurship program.